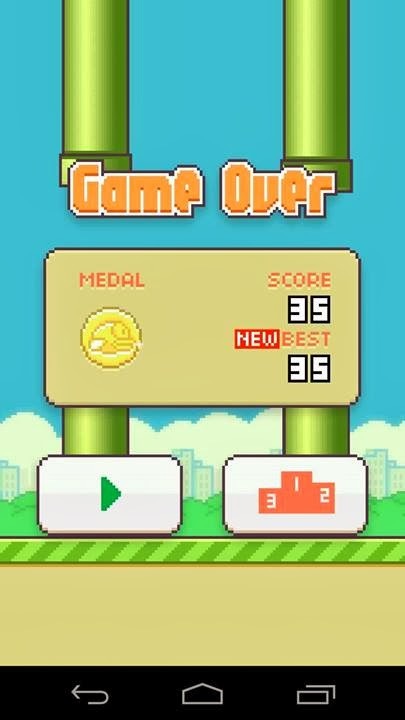 How to Succeed Playing Flappy Bird Game? Flappy Bird Game has been released since May 2013 for iOS and Android based devices. This game is suddenly popular and lively discussion on social media in early 2014, and even the mass media class Time and Forbes also helped to review this game. I’m sure everyone today, especially game fans already know what it Flappy Bird. The Game created by Nguyen of Vietnam is being hotly discussed and I was one of them. Initially I thought that the way to play the game is easy to play Flappy Bird. And it was easy. How to play a Flappy Bird is easy enough by tapping a finger to the screen to make the birds fly, and the bird was required to pass through green pipes. There is no challenge or another story ! But trouble arises when we passed tough the green pipes. And here lies the difficulty of the game Flappy Bird.